As the leaves change and the weather cools, two teams prepare for the game of their lives, or for some of the players, their afterlives. 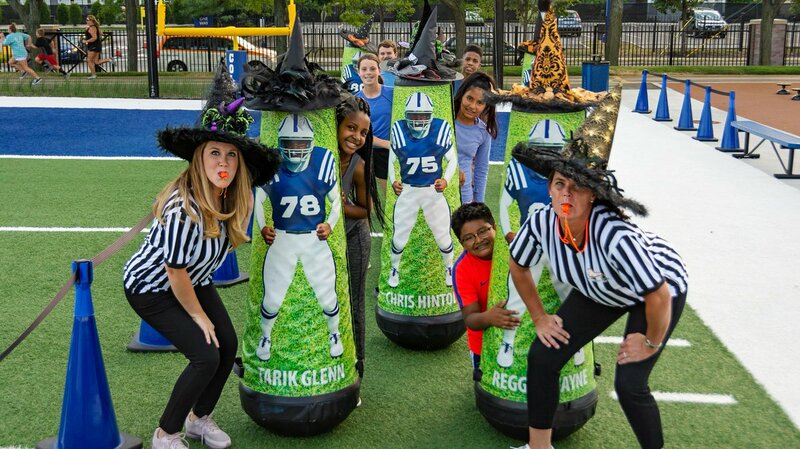 Come watch the ghastly face-off between the The Naptown Nightmares and The Circle City Screamers at the 55th annual The Children’s Museum Guild’s Haunted House Grim-nasium from October 11-31, 2018. Grab a roasted rat from the concession stand to watch the action, train with the teams in the House of Pain or find your ‘spirit’ in the pom-pom passage. No matter what, you won’t want to miss this Halloween experience. Before the trick-or-treating begins and the mountains of candy pile up, teach your little ones the importance of staying active to maintain a healthy lifestyle. Endurance, flexibility, and strength are all important for the monsters training for the big Halloween games— and for those promoting growth and development. The museum has a lot of opportunities for you and your family to stay active this Halloween, like the Sports Spooktacular on October 13. In addition to featuring dinner, music and entertainment, it also provides access to the new Riley Children’s Health Sports Legends Experience for hours of sports fun. The Black Hat Dash, a 1-mile/5K run and walk taking place October 27, is another great way for the family to explore fitness and endurance together. Get your heart racing from more than just exercise at the Grim-nasium, presented by Old National Bank. Tickets are available at the door, The Children’s Museum Box Office, or online. For more information, go to childrensmuseum.org/hauntedhouse. For spooktacular fun at home, have your family train like the monsters at the Grim-nasium by setting up some cans for Halloween Bowling! Peel all the paper labels off the tin cans and clean them. Next, choose the color paint you want and paint a base coat on the cans. After it is dry, you can begin creating the faces of Halloween ghouls, monsters, and ghosts. Add fun details that make your monsters scary— big scars, yellow eyes, jagged smiles. You can add glitter, cloth or any other decorations to make your monsters as unique as possible. Stack the monster cans on top of each other, grab a ball (tennis balls work wonderfully) and start bowling. Knock those cans down and stay active just like the monsters in the Grim-nasium.